Star Fox 2 is the cancelled sequel to Star Fox for the SNES, which was planned to be released in 1995. Star Fox 2 continues the original game's battle against Emperor Andross, who seeks to conquer the Lylat system. As a result, the Star Fox team assembles once again to defeat him. The game introduces a semi-real time gameplay system, as well as new ship types and two new Star Fox team members. Additionally, it has more advanced graphical capabilities than the previous game due to an improved version of the Super FX powered GSU-2 chip. Development of Star Fox 2 began on February 16, 1993, a mere five days before the Japanese release of the original game. The first public mention of the game was in the January 1994 issue of Game Players[page number needed], which stated that Star Fox 2 would feature split-screen multiplayer and use the Super FX 2 chip. Additionally, Dylan Cuthbert, the game's programmer, confirmed in a Usenet post that Star Fox 2 would continue to use polygons like the first game. At the 1995 Winter CES in Las Vegas, Nintendo featured several demos of Star Fox 2, where the game became so popular that a man named Shawn J. Freeman was arrested for attempting to steal a Star Fox 2 cartridge at the event. Despite Star Fox 2's massive popularity, Nintendo never revealed any updates about the game, and did not show it at that year's E3. Additionally, in the letters section of the September 1995 issue of Electronic Gaming Monthly[page number needed], an editor claimed that Star Fox 2 had been cancelled. However, Nintendo Power countered the claim, stating that the game had simply been delayed. Despite this, Nintendo never released any further news related to Star Fox 2, eventually cancelling it in favor of Star Fox 64. According to Dylan Cuthbert, the game was fully completed, but cancelled as a result of the Nintendo 64's impending release. In late 1999, an early prototype ROM of Star Fox 2 was leaked. However, it was far less complete than the version shown at CES, and was clearly an alpha build. In August 2002, the final version of Star Fox 2 was leaked by a user named skyhawk on the German fan translation site, Alemanic Translations. The user claimed that he discovered the game on a prototype cartridge and dumped the ROM himself, which was later proven to be false. In reality, the prototype originated from a former developer who wanted Star Fox 2 to be available to the public, and the ROM was not originally in a proper SNES ROM format. There was no source code leaked, nor were there any prototype cartridges containing this version of the ROM. Following the leak of Star Fox 2, SNES emulators began including Super FX support, allowing the game to be played as intended. However, the final build of Star Fox 2 was entirely in Japanese. In 2004, a team consisting of Gideon Zhi, d4s, Fusoya and satsu from Aeon Genesis successfully translated the game to English, and removed all debug info from the ROM. This unofficial translation quickly became popular for fanmade reproduction cartridges. Additionally, Evan Gowan of SNES Central was given Star Fox 2's source code, which originated from a programmer at a British game company with no apparent connection to the game's development. Three archives of the source code exist, dated April 15, May 6, and May 13, 1994. However, Gowan was asked to never distribute the source code, and it has never become available to the general public as a result. 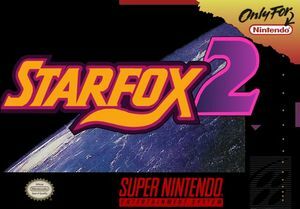 On June 26, 2017, 21 years after its cancellation, Nintendo announced that Star Fox 2 would get an official release as one of the games included on the SNES Classic Edition. For this subject's image gallery, see Gallery:Star Fox 2. The final prototype's title screen. ↑ Edge, issue 3 (page 8), December 1993. ↑ 2.0 2.1 2.2 2.3 2.4 SNES Central. Retrieved June 26, 2017. ↑ "Rumors of the demise of Star Fox 2 have been greatly exaggerated. Development of Nintendo's sequel to the hit 3-D space action game is finishing as we go to press. The big question mark is the release date, most likely in the first half of '96. The most recent versions of Star Fox 2 look very sharp and include a much more strategic feel, with radar windows and mother ships where you dock after battle." Nintendo Power, issue 76[page number needed], September 1995. ↑ Eurogamer. Retrieved June 26, 2017. ↑ Nintendo. Retrieved June 26, 2017. This page was last edited on 1 July 2017, at 09:07.